It’s her fault for assuming that a faceless man in a suit in the middle of the forest in the dead of the night was going to kill her. Also, I hear she’s a white supremacist. I think I like Slanderman more then Slenderman. 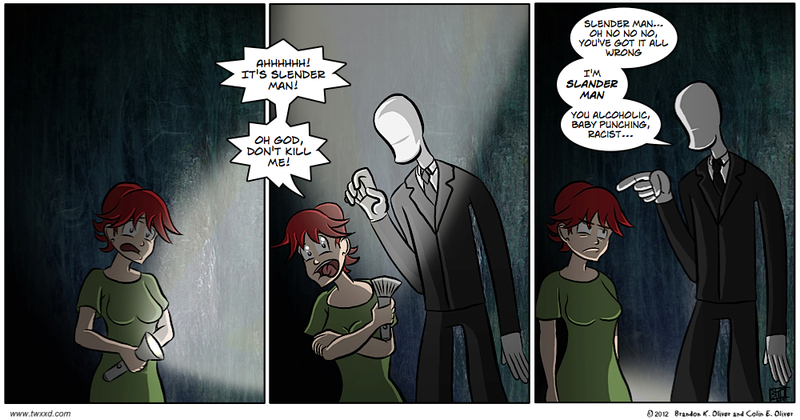 But then again, I don’t really see the hype around Slenderman. To me, he’s just a Silent Hill monster in a suit. That’s a really good point. He really does need something better than “faceless creature sneaks up and kills you”. One letter can make a Big difference. At least he wasn’t Blender man. Truth, that could get bloody and messy very quickly. I’m too scared to play that game. For reals. Lol, it’s not as bad as some have made it to be. Well drawn cuz! PUNNY too! Artwork is getting better and better Brandon. The victims of false identity are always faceless. Oh man, I genuinely laughed at that one Warren. Slenderman Slenderman Slenderman Slenderman Slenderman. Yes, I know. I’m being old and cryptic again. I want more adventures with this man.